An introduction to epidemiology. Please ask any questions you have about starting a career in epidemiology. Enjoy! As I write this blog post, the sea levels are rising and small islands populations are being submerged. The earth’s biodiversity is diminishing and species are being lost. The oceans are acidifying and the grasslands are turning into deserts. As I sip my tea and calculate my Ecological Footprint, deforestation rages on and millions of climate refugees are living in forced exile. It’s hard for me not to feel guilty, but it is is even harder to know what I should do about it. Bill Gates argues in his 2010 TED talk that we need to “innovate to zero” (Gates, 2010). To reduce global carbon emissions enough to avoid planetary catastrophe, Gates says, we need technological solutions to meet our energy needs. These solutions must be safe, cheaper than the current, dirty alternatives, and be able to support the energy requirements of the growing global population. He presents his support for ‘safe’, ‘cheap’, ‘clean’ energy solutions as if all of the possibilities have been considered, this is the best that we’ve got, and it can work, dagnammit. He doesn’t really deny that the world could be “f**ked” (in the words of Naomi Klein) (Klein, 2013), but he definitely doesn’t use that language. He seems very optimistic about humans’ scientific capabilities, an appealing message to those who may feel the situation is beyond our control as individuals. According to Bill, we CAN solve problems using the same thinking (aka free market economy) we used when we created them. Einstein just rolled over in his grave. The discussion that followed in the group with whom I sat watching this video, was telling. We were a group of peers; all graduate students in a faculty of health sciences in a ‘reputable’ Canadian university. Our diametric reactions to Gates’ proposition surprised me somewhat. There was outrage from one corner over the fact that we gave 20 minutes of our undivided attention to a billionaire who was basically arguing for “business-as-usual pursuit of profits and growth [that is] destabilizing life on earth” (Klein, 2010). From another corner, I interpreted a feeling of relief and promise: Wouldn’t it be nice if we (humans) didn’t need to change our lifestyles and consumption patterns in order to save the planet? Isn’t that what we all really want? From within our small cohort, our worldviews have led us to similar perspectives of climate change risk (Kahan et al, 2012)- we are all proponents -but quite different perspectives on what should be done about it. Kahan et al (2012, p. 734) present evidence that “simply improving the clarity of scientific information will not dispel public conflict so long as the climate-change debate continues to feature cultural meanings that divide citizens of opposing world-views”. I agree with the importance of this line of inquiry and the authors’ call for strategies that “create a deliberative climate in which accepting the best available science does not threaten any group’s values” (Kahan et al, 2012, p. 734). I am, however, more concerned about how to “promote constructive and informed public deliberations” (Kahan et al, 2012, p. 734) among climate change proponents on how to get us out of this mess. If the first step is to agree that climate change is happening, it is (largely) manmade, and the consequences are disastrous, the next is to join forces to actually do something about it. Convincing people that climate change is real may be possible without threatening any group’s values, but unlike the Bill Gates camp, I think in order to change its course, altering dominant cultural values is an urgent necessity. My classroom observations provide evidence that step two may indeed be the more difficult battle. As I put the finishing touches on this blog post, I am eavesdropping on a group of self-proclaimed activists who are fundraising for environmental justice. As I post my reflection, the word revolution is being tossed around and interrupting my thoughts. As difficult as it sounds, I think I have my answer. Kahan et al. 2012. The polarizing impact of science literacy and numeracy on perceived climate change risks. Nature Climate Change. Epub, Vol 2, October 2012. I’ve been thinking a lot lately about the concept of complexity. Complexity thrills and challenges me, especially social complexity. Two of my favorite scientists, Richard Lewontin and Richard Levins, persuasively argue in their (incredible, must-read) book Biology Under the Influence: Dialectical essays on ecology, agriculture, and health, that the social and the biological are inextricably linked; how we frame questions and who we ask in many ways predetermines the answers. This is the primary reason why I don’t believe that neutrality in science is possible; as Lewontin and Levins themselves state, “as a product of human activity, science reflects the conditions of its production and the viewpoints of its producers or owners” (2007, p. 90). When we’re faced with a complex problem, what questions do we ask to elicit understanding, and who do we ask? Different starting points lead us to very different conclusions. Type 2 Diabetes is a great example. If you consult the Canadian Diabetes Association website they will define type 2 diabetes as “a disease in which your pancreas does not produce enough insulin, or your body does not properly use the insulin it makes. As a result, glucose (sugar) builds up in your blood instead of being used for energy.” In my work as a Registered Midwife, we are taught to talk to women about risk factors ranging from family history of the disease, age, and body weight to lifestyle and ethnicity. Some of these risk factors are completely ascientific – purely social categories. If a woman has abnormal post-fasting glucose levels, we send her to an endocrinologist and a diabetic counselor; we may be able to help women normalize their blood sugars, but how are we impacting the disease? After many years of witnessing predictable patterns of whom amongst my patients were diagnosed with gestational diabetes, and hundreds of hours leading popular health education workshops with the Alliance for People’s Health (APH) it became increasingly obvious to me that diabetes is a disease of colonialism and capitalism. Through the People’s Health Series at the APH I heard dozens of stories of the impacts of gross food injustice on exploited communities. 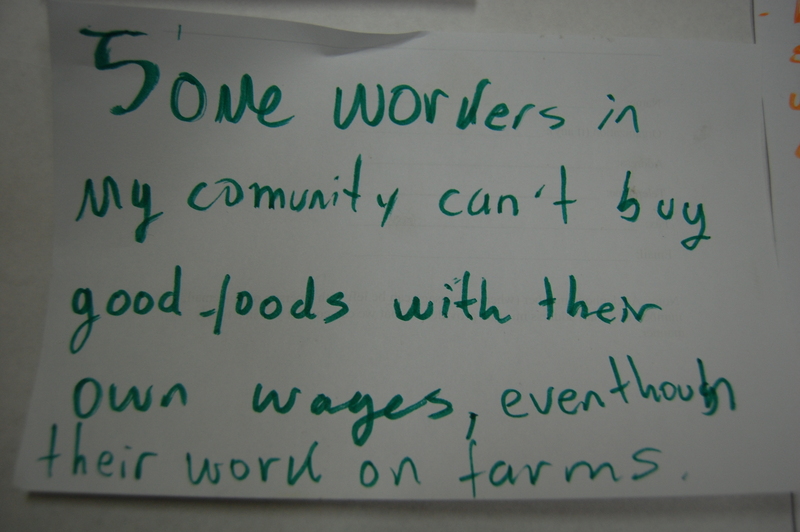 Through community mapping we collectively identified almost-impossible access to land and fresh foods and ubiquitous access to cheap junk foods. The poor are often living enforced sedentary lifestyles. I changed the way I talk to women about the disease out of frustration at both the narrow biological construction and medical orientation of the disease as well as the blaming and shaming that accompany diagnosis. I now ask very different questions about diabetes and look to lay communities for the answers. Migrant Mexican farm worker confronts food injustice. As it turns out that there are many others out there who agree with this perspective; those who seek to challenge narrowing complex social phenomena as diseases biological in origin. There are many out there who critique a narrow, Western, biomedical framework for understanding disease – not just diabetes, but other diseases, too. This is not to say there isn’t a role for medicine, but that bio-medicine should not be our starting place. Embracing the complexity of diabetes requires confronting major social and economic challenges: the generational impacts of colonial occupation and privatization of the land, forced human migration, mass death from unknown diseases, loss of traditional healing methods and forced separation from traditional plants, commodification of food, and separation from traditional and natural food sources (Davis, 2013; Waldstein, 2010). Some are even asking: how does diagnosing someone with type 2 diabetes contribute to harm? In her excellent paper Coping with diabetes and generational trauma in Salish tribal communities, Renee Davis remarks, “bio-medical rationale and methods often mimics the ideologies of government policies of early colonialism” (p. 57). Through my own midwifery work at the Strathcona Midwifery Collective and through my popular work with the Alliance for People’s Health I have learned first-hand that we can harm people with our narrow views; structural racism is embedded in Western medicine and science. This is why I was drawn to my own questions of the harms caused by Western prenatal practices within working class and historically and systemically-oppressed communities. When tackling complex problems, social, biological, or ecological, one final question worthy of consideration: who is going to benefit from proposed solutions? Directly benefit, in economic and social terms: prestige, status, income, and material comforts – not just biomedical outcomes as in reduced disease incidence. Parting words from Lewontin and Levins, “[t]here is, then, a growing conflict between the urgent need of our species for the integration and democratization of science, and the economics and sociology of commercialized knowledge that impedes such development. We might attempt merely to predict, detect, or to tolerate the outcome of that conflict. Or we could join the struggle to affect what happens.” (p. 217). Davis, R. (2013). Coping with diabetes and generational trauma in Salish tribal communities. Fourth World Journal, 12(1), pp. 45-78. Lewontin, R.C., and Levins,R. (2007). Biology Under The Influence, Dialectical Essays on Ecology, Agriculture, and Health. New York: Monthly Review Press. Waldstein, A. (2010). Popular Medicine and Self-Care in a Mexican Migrant Community: Toward an explanation of an epidemiological paradox. Medical Anthropology, 29(1), pp. 71-107. One essential feature of any good fairytale is a lesson. Originally written for adults, many of these stories persist as warnings to children to behave properly lest some terrible monster eat them (Paton, 2011). Now, let me tell you a story. There was once a poor woodcarver named Silva. After being abandoned as a young boy, Silva spent his life in solitude, living off the land around him. His only amusement was the figures he crafted from trees around his home. He may not have understood the lavish indulgences of a well-endowed supper table but he was happy. One day his peaceful seclusion came to an end, for Silva encountered Morus. Morus, unlike Silva, had spent his entire life surrounded by the push and pull of other people. His family, crowded and destitute, had sent him out to seek new lands and great fortunes. Upon stumbling onto Silva’s forest home, he was fascinated by this simple, peaceful life. Morus wanted to know how to replicate the prosperity he saw in Silva’s existence. For such land with so many opportunities must be a boon for any man. Silva, amazed yet frightened by this revelation of mankind, accommodated Morus’ inquiries. 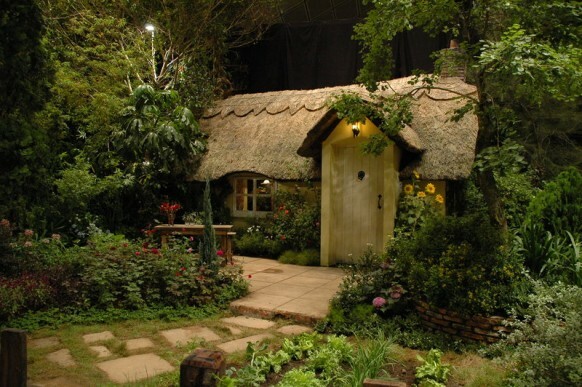 Silva showed how he chose the right tree for carving, caught his game and built his home with stones. Morus began to understand Silva’s livelihood, albeit with difficulty, but also saw a way to improve it. “Because you can, when so many can’t!” Morus replied. Silva returned to silence wondering how one could sell what one did not own? His cycles and patterns were not just his but also the forest’s, he followed its will as surely as he did his own. Morus realized the only way to show Silva the potential of his schemes was a demonstration. One morning, weeks and days later, Silva awoke to the sound of several voices. Startled, he rushed outside to the late morning light. Morus stood with several other men around a large mound in the distance. As he approached it became clear this pile contained the corpses of hundreds of birds. Morus turned towards him, a broad grin on his face. Silva could not speak; his heart beat with a staccato rhythm. These birds could have fed him for years and at once were gone. “What have you done?” He whispered as he reached the gruesome reaping. Silva turned away in anguish. Morus did not understand his misery, there were trees to spare and land to cultivate. One only needed to move forward, to expand. Morus and Silva parted ways that day, one back to his family to report of this wealth, the other to despair in his lost peace. 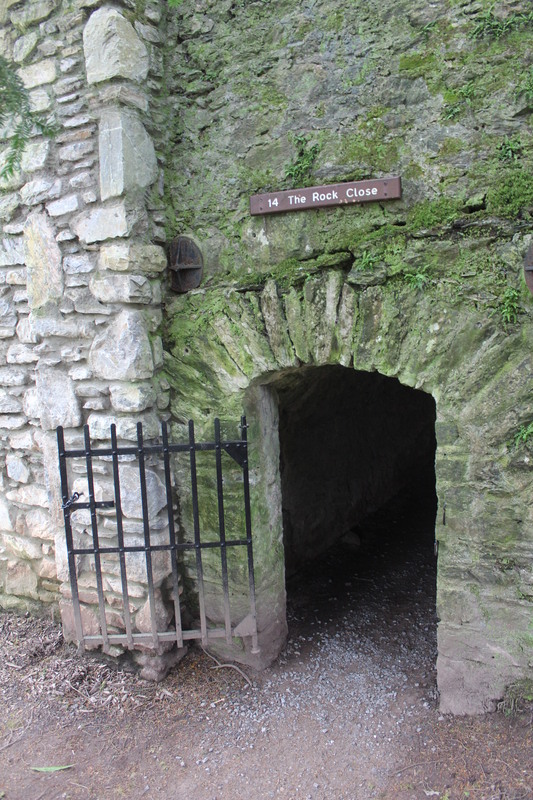 Over the years the forest disappeared, the rough stone house weathered to nothing. Silva, though long forgotten, saw the true result of his encounter with Morus. For when you destroy what cannot be replaced, you may gain wealth but will lose life. What is at one time taken away, can never be given back. Morus is hopefully, obviously a representation of humanity’s effect upon the earth. Silva is the earth, willing to accommodate us at first but unable to stop our destruction. The single, greatest concern for population health is climate change. Public health requires living populations and thus a habitable earth to be of any use. We need to rebrand climate change as this message (Subramanian, 2013). Hopefully my overdramatic fairytale provided some small moral lesson, treat our earth well and we can survive. Paton, G. (2011 Mar 14). 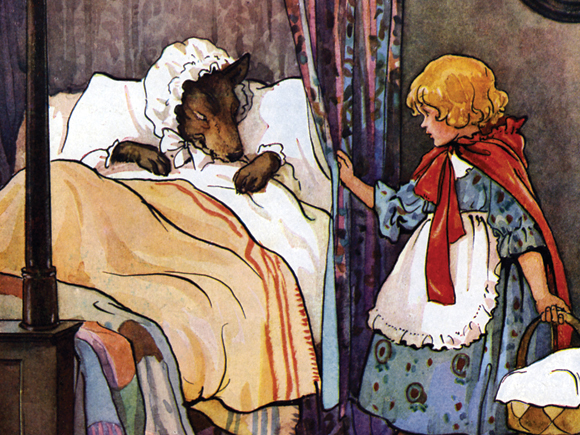 Parents who shun fairytales ‘miss chance to teach children morality’. Retrieved from http://www.telegraph.co.uk/education/educationnews/8378975/Parents-who-shun-fairytales-miss-chance-to-teach-children-morality.html. Subramanian, C. (2013, August 08). Rebranding Climate Change as a Public Health Issue. Retrieved from http://healthland.time.com/2013/08/08/rebranding-climate-change-as-a-public-health-issue/. Technology is the collection of tools, machines, techniques and methods to overcome a problem, find a better solution for a pre-existing problem and discover simpler ways to handle a situation. Technology affects human’s life as well as other species on earth. People apply different forms of technology in their daily life and are not aware of its impacts on their lives. Technology has both beneficial and unfavourable influences on our lives. Certainly, technology has had numbers of great influences on the medical procedures. There are many devices and tools that simplify diagnosis and treatment of diseases. For instance, recently researchers have developed a laser device for treatment of neurological disorders such as Alzheimer’s (1). Another example is the devices that assist diabetics to measure blood sugar without going to a clinic. Moreover, technology has affected the education systems. Some schools incorporate different technologies in their teaching and training programs (2). Students can communicate and discuss their projects with others from different countries. Nowadays, we can quickly access the news from our computers and phones. We can even set our phones to send notifications when our favorite hockey team scores. Definitely, technology has had unfavourable and disadvantages effects as well. Technology has contributed significantly to the earth pollution. Industrial factories that produce different tools and machines are among major sources of air and water pollutions and climate chaos. Industrial factories mostly apply fossil fuels that are a major source of pollutants including carbon monoxide (CO), nitrogen dioxide (NO2) and particulate matters (PM). The levels of these pollutants in some cities are a major concern and governments have devoted a lot of money to overcome this matter. In cities like Paris, the public transportation system is free of charge on particular days, encouraging people to commute with buses and trains (3). Moreover, the waste that is generated by producing these gadgets has influenced the environment. Unfortunately, people that use these technologies to a less degree are in more danger (4). For instance, people in poor neighbourhoods use wood stoves to cut down the cost of living and as a result are more exposed to pollutants such as PMs. But what we mostly ignore or not consider as pollution, is the effects of technology on our minds, life styles and thoughts. Technology has had huge impacts on the way we communicate, the time we spend together, our creativity in solving problems and cultures. Technology has not only polluted our air and water, but it has polluted our minds. These days, family members spend less time together and more time with their phones and computers. Kids barely play outside and are mostly occupied with their video games. Watching a TV commercial that encourages parents to push their kids to have at least 60 minutes of physical activity, made me realize that the effects of technology on our minds and life styles is greater than we think. Possibly, the adverse effects of technology in our lives whether it is the polluted air or minds have roots in our desire and willingness to always go for fancier and better devices and gadgets. I think the threat of lack of communication among family members because of their occupation with phones and computers is as destructive as technology’s impacts on the environment. Technology is gradually affecting the human’s nature. As humans we used to be able to survive with minimal resources and nowadays we feel so insecure to leave home without a cellphone. Unfortunately, our attachments to technology have polluted our minds and lifestyles. 4-Lipfert. F. W. (2004). Air pollution and poverty: Does the sword cut both ways? Journal of Epidemiology and Community Health; 58(1):2-3. Global warming deniers what do you do? The world is getting warmer, the climate is changing, ice caps are melting, ecosystems are being destroyed, and many species are becoming extinct. Hundreds of thousands of reports are being churned out by scientists from all levels of society providing evidence and facts supporting global warming as a direct result of human activity. These reports lay out statistics, facts, measurements, proposed mechanisms, and physical evidence of the world changing around us. However, no matter how much evidence is being churned out there are always some who believe otherwise and that global warming is a hoax or one big gigantic farce or conspiracy theory. To be frank, what are these people smoking? They include prominent business men (Donald Trump), rock star (Ted Nugent) and even United States Senators. (MNN, 2014) How are they refuting these facts or published scientific facts? What other possible evidence could they provide to refute the occurrence of man made global warming. Well basically there isn’t any other scientific data left to refute what is currently out there. More than 97% of climatologists agree that climate change is caused by human activity and the other 3% are arguing over what exactly is causing global warming. (Cook, 2013) There have been many rebuttals to statements and claims climate change denialists that are worth a read. For example, here (http://www.policymic.com/articles/84887/bill-nye-responds-to-7-real-arguments-made-by-climate-change-deniers) by our favourite TV scientist Bill Nye and here (http://www.skepticalscience.com/argument.php). If the science is sound and in agreement with one another, what possible reason or motivation would a denialist have? To begin with, there are BILLIONS and perhaps TRILLIONS (of dollars that is) of reasons why they would want to deny climate change. For example, the production and use of fossil fuels is perhaps the largest contributor to CO­2 emissions in the world and the industry behind it easily earns $100 billion dollars annually. That is a whole lot of money to be gained from denying global warming or lose by admitting to global warming. Also unfortunately we are living in a consumerist market where the need to upgrade every year to the latest and greatest “stuff” increases the demand on the manufacturing industry which also contributes heavily to CO2 and pollutant emissions. If it is all about money, what would happen if we were able to magically take out the economic side of things and provide greater incentives or rewards to go “green”? Would there still be denialists? Maybe there will be fewer denialists if any at all… (just a thought). An interesting point was brought up during our HSCI 902 class, that the rate of those that didn’t believe in global warming were actually growing and a Gallup pole (http://www.gallup.com/poll/167972/steady-blame-humans-global-warming.aspx) conducted showed some surprising results as well. They found that the trend ~57% of individuals in the United States believe global warming was due to human causes. What was most surprising was that the rate of college graduates believing global warming was due to human activities actually decreased where in non-college graduates stayed steady. Also perhaps unsurprising was Democrats and Republicans believe in opposing trends and independents actually siding more closely with Republicans. How are we supposed to curb this trend and turn the deniers into believers? In our class some brought up education, some mentioned speaking respectfully and voicing our opinions but not overstepping our expertise boundaries. However I find that hard to do when the facts are clearly out there and even belief in the college educated population in the United States is waning and skepticism is growing. So I find it hard sometimes to logically and respectfully provide a rebuttal to illogical thoughts. The other side would be to introduce legislation towards “green” practices altogether and forgo logical discussion but would still be difficult considering deniers are the other half of those making the legislation. Walking In Unfamiliar but Exciting Shoes! 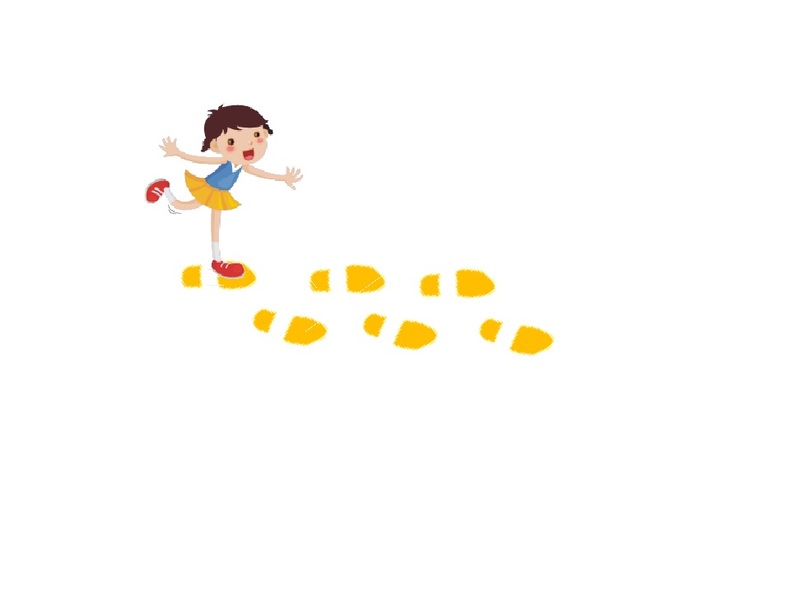 It’s always interesting when you spend a day walking in someone else’s shoes, especially if they do something very different from you! I was lucky enough to shadow someone from geography and it was really exciting to hear about his work, and let me tell you it is not even close to what I do. His project looks at medical tourism in the Caribbean, and involves qualitative research methods. Since a lot of his work is currently consisting of working at a computer we decided to have an informal chat over coffee. I had so much fun hearing about his research that I spent almost ½ an hour listening to him talk about his project and I almost forgot to ask him my interview questions. -Go out and interview people usually 2 (a busy day would be interviewing 3-4-which can get a bit crazy). Each interview takes on average 1 hour but can vary (it can be really short or long depending on the interviewee) -> When asked what a good day would be, he explained that it would be travelling to meet people and making new contacts or ending up in situations not planned or expected but end up helping in your research!—Here is really where I saw a difference in our research. I would consider a successful day as getting results (i.e. an experiment working or finding a new pathway I can target, etc. )—not making new contacts or ending up in exciting situations, which do happen sometimes but are rare. -Go back and organize data, recordings and notes, etc. I was told data was collected by conducting semi-structured interviews with locals, consultants of medical tourism, policy planners, local providers of care, etc. and questions were based around health politics and equity. This time around my host had two groups to collect data from, one group consisted of people who use the countries local health care system, and the other was nurses who work in health care field. My host explained to me that he gets some down time when he gets back home, but a lot of time is spent in front of the computer doing the above tasks. I was really interested in how data analysis was carried out on qualitative data and learnt that it is extremely different from my data analysis! Data is analyzed using schematic analysis for qualitative data management. This data is then used to help build narratives that show general trends and dynamics surrounding the topic area. The thing I found really interesting about my hosts data analysis, was that he did it in parallel with another student. By doing this he is able to eliminate any biases he may be subconsciously making and he is able to make sure he doesn’t miss any analysis. Although I am able to work with my lab mates when I need help analyzing my data a lot of it is done on my own or with my supervisor, yet another difference between our fields. The one similarity I found with his project and mine was that we entered a program where the research project and question had been clearly outline and initiated in some way by our supervisors, and that we were both lucky enough to have good contact with our supervisors when needed. Other than that our fields are quite different but this makes for an interesting conversation. The only down side to talking to people in different fields from me is that I can’t help but always wonder if I went into the wrong field after hearing about their research. I know I didn’t, and I love what I do, but it is always fun to hear what others are up to. Maybe one day I can find someone in a different field from me that I can collaborate with! 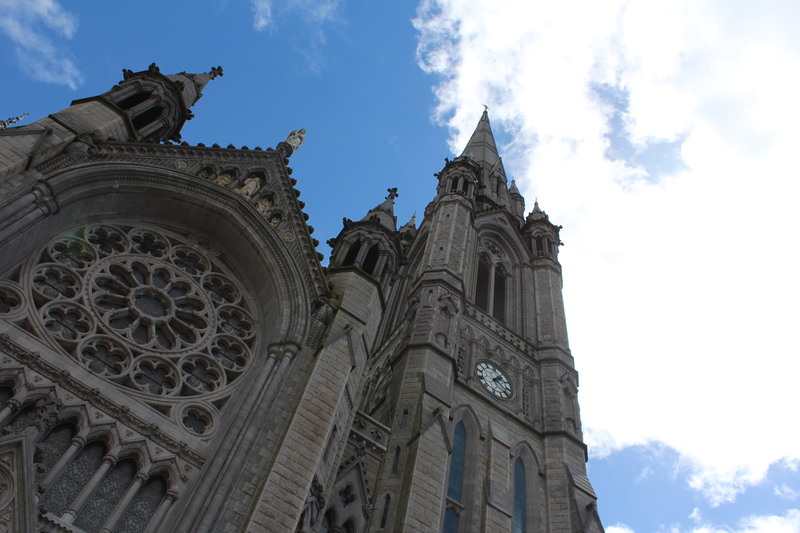 Locked in the Ivory Tower: Am I trapped, stuck or merely biding my time? Sometimes it feels like my entire life has been spent behind a computer. From studying to writing essays to working on my research, I spend a lot of time on my own staring at a blinking cursor. As much as this is a reality of my studies in biostatistics and epidemiology, I cannot help but feel I am missing an integral part of the health sciences academic experience. That is collecting data and interacting with the subjects of my research. I rarely encounter people who are not either fellow academics or students. I am beginning to wonder what it is like in that big, bright world outside the ivory tower? I recently had the opportunity to glimpse at this world when I shadowed a fellow graduate student and former clinical lead with the Portland Hotel Society in the Downtown Eastside (DTES) of Vancouver. His work involved a project on which my supervisor and research lab had done the statistical analysis. It was a unique opportunity for me to see the neighbourhood and people behind the de-identified statistical IDs I use for modeling. His responsibilities included running an arm of the study that provided housing interventions, including both managerial and counseling work, for homeless residents of the DTES. He worked with these people on a one-to-one basis, planning treatment regimes for both mental and health services using a strong, team-based approach. This, ultimately, could not be more different than what I do. The world of collecting data, which is a rather cold way of saying providing services and working with participants, is the entire basis of my work. I could not run a statistical analysis without that data, yet I rarely get the chance to understand the circumstances of how it is collected. More importantly, I have few opportunities to understand the people the data represents. I keenly felt this reality during my shadowing time. As I discovered, working with the participants could be a nine-to-five job but with the added caveat of extended hours for emergencies. The stark reality is that you need to be available when people die, often not within normal working hours. I have no concept of this type of stress. When I asked what that felt like, I received the expected response, not at all pleasant. There are however mental health strategies in place for this type of work including flexible hours, staff activities and vacation time. I realize, as typing this, that these emergencies faced by clinical staff are the very same numbers I see in a statistical database as censoring dates, or time of leaving the cohort. That is something I will take away from the experience with a slightly heavy heart. As I walked around the DTES during my shadowing, several people stopped us whether to catch up, chat or request help. It was amazing, the connections I saw, this work is definitely not done while staring at a blinking cursor. As I reflect on this experience my most central question is how important is it that I know these “real-world” realities? Does it matter for statistical modeling? I hope that the answer is yes. It brings me back to the idea of multidisciplinarity. We need to understand more than our own training to develop effective multidisciplinary teams (Choi & Pak, 2006). I try to represent real-world health phenomena with biostatistical models. I must know the context of the problem in order to create reliable analyses. As well, understanding the inequities of our world is important to me personally. I work in this field because I care about health at the population level, particularly for those most vulnerable to poor health. I am sure as I progress in my career I will have more opportunities to work outside of a computer lab. To extend my initial metaphor, I wonder in the meantime what champion will release me from this locked tower? Luckily no actual chains exist and that champion, I imagine, will be my own ardent effort to fight against the idea that I am only a “numbers person”. Escape from the tower requires that I simply push through the door. Choi, B.C.K. & Pak A.W.P. (2006). “Multidisciplinarity, interdisciplinarity, and transdisciplinarity in health research, services, education and policy: 1. Definitions, objectives, and evidence of effectiveness.” Clinical and Investigative Medicine, 29, 351-364. Holton, S.A. (2002). 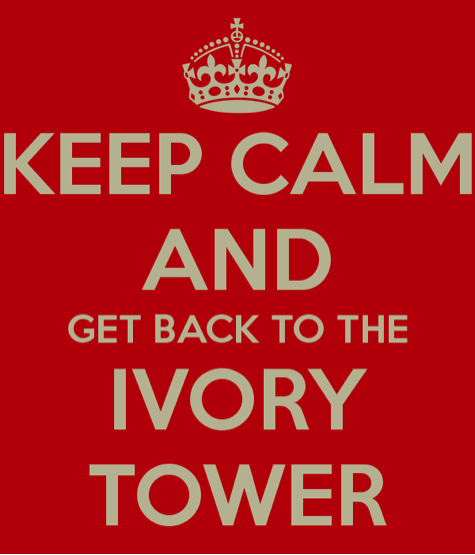 “Why an ivory tower?” The National Teaching & Learning Forum. 11(3), 1-12. 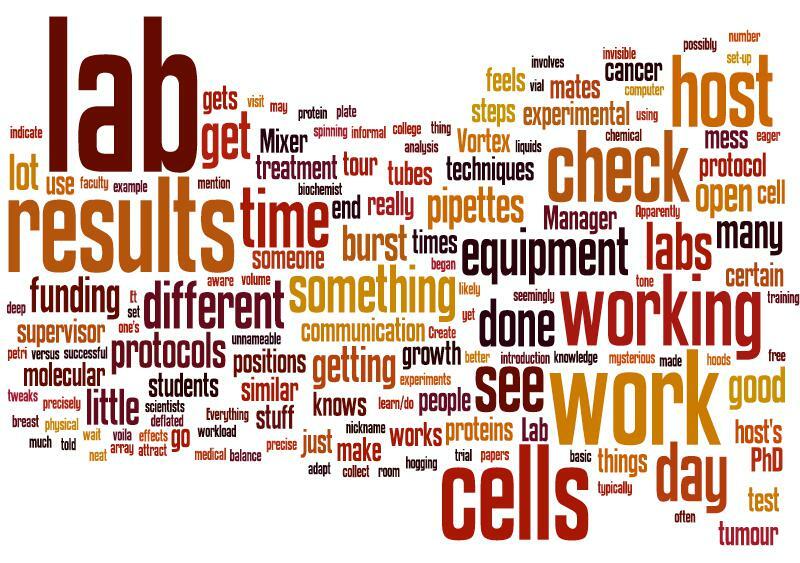 A word cloud created from the notes and observations I made during my visit in the lab. 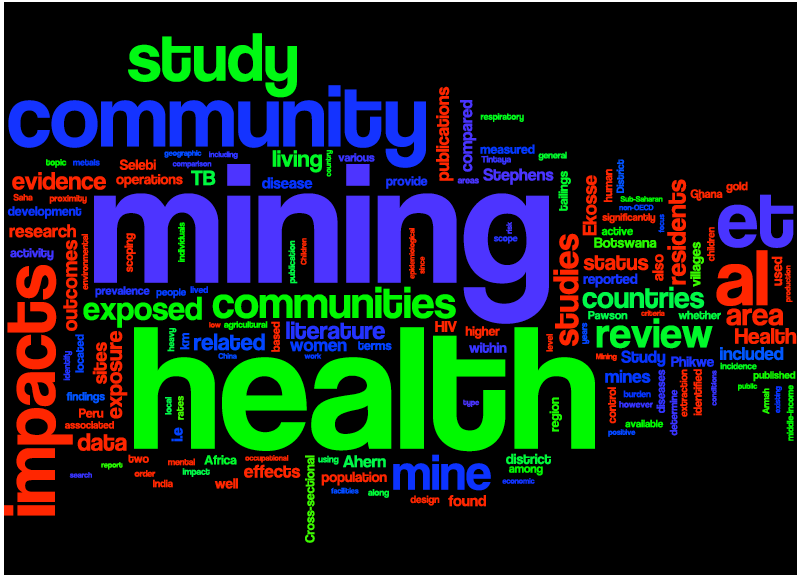 A word cloud created from the text of a review paper I wrote on my current research topic. I recently embarked on an exploratory sojourn deep into the heart of the mysterious Laboratory. Having just read a volume on Henrietta Lacks’ intriguing immortal cells , I was excited to be there. I entered the land of workbenches, test tubes and pipettes, in awe. There was so much STUFF everywhere. Vial upon vial of liquids of various colours. Expensive, foreign looking equipment and unnameable apparatuses. Cluttered yet sterile. Bright and quiet with only a few people around, each seemingly doing his or her own thing. As I was still trying to take it all in, my unofficial tour began. The set-up is open concept with three separate labs sharing the same room, each with its own section. To create order, there are sign-up sheets for some equipment but informal communication often occurs with other Labsters (my nickname for people who work in a lab) to indicate when certain equipment will be in use and to let others know if someone “will be hogging it” or if what someone is working on is “time sensitive”. Everyone is in charge of his or her own lab and is responsible for her or his own stuff. My host admits to getting a little “pissed off” with her labmates if there is a mess. “If you made the mess, clean it up!” Literally. Apparently I saw the “hoods” on a good (relatively neat and orderly) day. My host’s tone told me that this was not typically the case. The lab boss is a molecular biologist. My host, a self-proclaimed molecular biochemist. She wants to go to medical school. Others who do similar work might get Research Assistant or Lab Manager positions. To be a Project Manager a PhD is required and likely a Post Doc. It is really competitive to get faculty positions and one’s own lab. Not surprisingly, if you don’t continue to get funding, the lab shuts down. Et voila. Pull in or perish. In her lab (and similar labs) they do not collaborate with other labs doing related research because of competition over funding, and for getting and publishing results. With the basic introduction and tour complete, I was ready to get to down to some of the nitty gritty. I was an eager laboratory novice and my ever-generous host was keen to share her wisdom. My host researches the effects of “knocking out” a specific cell protein on the rate of tumour growth. She is working on breast cancer tumour cells. She hopes her findings will contribute to the development of cancer treatment. When I came for my visit, she had already done the treatment on her cells – hypoxia versus normoxia – and that day she would be extracting the proteins. A lot of prep work is needed before actually starting the experimental protocol. Ice bucket, check. Label and set up test tubes, check. Create fresh buffer solution to burst cells open, check. Prepare scrapers for getting cells off the plate, check. Help burst the cells open using a Vortex Mixer, check. A Vortex Mixer!?!?! Awesome. Put the cells on ice and wait 20 minutes for them to burst so we can collect their contents, check. Needless to say, a lot of her work involves working with pipettes. She meticulously records everything she does and all of her results in a lab notebook. If something works, she can see why, if something doesn’t work, she can (hopefully) see why. Everything she does must be precise and recorded precisely. To make good use of her time, she updates her lab book when something is “spinning” (for example) or when she has a “nice little chunk of time”. My host has done her experimental protocols so many times by this point so knows them well. She has a number of experiments on the go simultaneously that she works on as she waits for other steps, such as cell growth, to finish. From preparing proteins to growing cells or running assays, there’s a lot to be done. During her ‘free’ time, she crunches numbers on the computer or reads up on papers to see what she can learn/do to make things work better. Each Labster mostly just work on his or her own stuff. Each is working on different a “piece of the puzzle”, but they help each other with ideas. My host gets little direct supervision from her supervisor but has ongoing communication with him. After doing all steps of her experimental protocol on her own, she goes over the results of her analysis with her supervisor. She learns mainly through hands on training, and trial and error. Lab scientists attain and adapt different techniques from working in different labs. She follows chemical protocols and tweaks them as appropriate. There are so many protocols (and did I mention the pipettes?). Apart from knowledge of different chemicals and equipment, she has picked up and perfected an array of physical techniques and motor skills. Watching her hold petri dishes and aspirate liquid, it was obvious that she had done these things many times. In the lab, one is always anticipating and hoping for a certain outcome. A successful day is when you gets the result that you want to see. If my host’s experiment does not work, she feels deflated, and is aware of the extra time she will have to spend to correct it, meanwhile never really knowing why something is not working because she “can’t talk to it”. She tries to maintain a good work-life balance and avoids being in the lab for twelve hours a day like other labsters she knows. But at the end of the day, she feels pressure for results – “Negative results are results too but nobody publishes bad results” nor do they attract funding. “PhD students have a heavier workload and have to be able to show that they have four years of results by the end of their program.” The invisible college may be hard to see, but it sure was loud and clear. Skoot, Rebecca. (2011). The Immortal Life of Henrietta Lacks. Large Print Press, 2011.